Eat Vintage. Ditch hunger. Feel better. Vintage eating means going back to the foods your great-grandparents used to eat. Back when people used to feel satisfied between meals and look and feel better. The secret is vintage, full-fat food. Cooking with fat is the vintage way to make dinners simple, savory, and satisfying. Healthier, too. We'll show you how. Our mix-and-match plates offer inspiration for dozens of everyday meals. A is for Adequate protein. Protein comes first! Be sure to include enough to keep you satisfied between meals—about 4oz of meat, fish, cheese, or 3-4 eggs. More if you are tall, active, or eating less than 3 protein-packed meals per day. B is for Bright Veggies. Make bright, non-starchy veggies the center of your plate. Prepare them with a vintage cooking fat or serve with melted butter, dip, or dressing. C is for Careful Carbs. Add about a cup of starchy vegetables—or a substitute if you are carb-sensitive—to round out your meal. Prepare with a vintage cooking fat or serve with butter, dip, or dressing. What does vintage grocery shopping look like? Watch this fun, fast-paced short. Real food is visually stunning! Far too many of us are struggling with weight with serious health issues. By age 50, more than half of us have metabolic syndrome, which is the 'on-ramp' to diabetes, heart disease, or both. This is not normal. Something is wrong with the modern American low-fat diet. Learn why and how vintage eating can help. 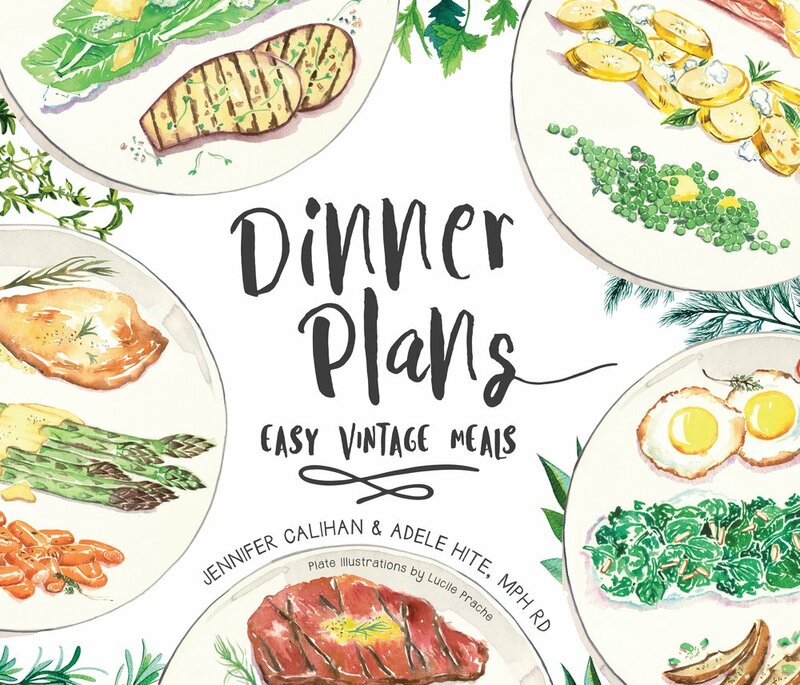 Everyday, vintage meals made fun and easy with our colorful book, Dinner Plans. Inspiration, recipes, plus tips and tricks for setting up your vintage pantry and kitchen. Watch Dinner Plans in action!